. TPO Roofing in Houston | Roofing Companies Houston Texas | Anchor Roofing Inc. There are generic single ply membranes on the market that are just that. When it comes to TPO if it doesn’t display the Energy Star Symbol of approval then it hasn’t been on the market for 3 years yet and met performance criteria. The BIG 3 Manufacturers, Carlisle-Syntec – Includes Versico, Firestone, and John Mansville are all tier one products that have seen full term on many of their NDL (No Dollar Limit) total system warranty for 20 years and still have life in them. Just because a manufacturer meets ASTM D 4434 doesn’t guarantee that their TPO will perform as intended for years to come. Proven performance over a long term is the best way to judge quality. There are many different types of TPO Roofing ranging from 45mil reinforced to 135 mil reinforced Fleeceback. What is Fleeceback? Fleeceback TPO is a regular TPO membrane with 55mils of matting on the back side of the membrane that provide increased adhesion, puncture resistance, and even the ability to be applied via hot application with Type 3 Asphalt. In sum a 115mil TPO fleeceback is actually a 60mil reinforced membrane with a 55 mil Fleece covered backside to equal 115mils; hence the 115 mil Fleeceback TPO size. Some other benefits of Fleeceback is that it is a perfect candidate for a layover directly on top of a built up modified roof system, assuming only one roof is present. Fleeceback can be glued or mopped with Type 3 Asphalt directly on top of a built up modified roof system helping to avoid the expense of a tear off. Secretary Chu recognizes the benefits of Cool Roofing as his video clearly explains the benefits both short term and long term. Congress also has pending legislation, The Roofing Efficiency Jobs Act of 2011. I have posted links in this article so you can read more about this; however if passed it is expected to create 40,000 + jobs in the Commercial Roofing Industry and with the benchmark on Solar Reflectivity to qualify set at 75% reflectivity Single PlyTPO is a likely contender to get the largest share of this emerging market with its above benchmark reflectivity. Wall Mart the largest private consumer of electricity in the United States specifies TPO for all their new stores. If they see the benefit, their architects specify it, and they endorse it as a company it leaves little room for debate in comparison to asphalt-based built up systems. TPO like all roofing materials shares the similarity that the quality of the product and the quality of the installers is symbiotic when it comes to performance and life cycle. That is why not all TPO is created equal. 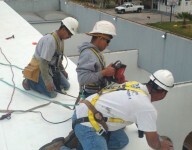 Contact us for roof repair Houston in Texas for reconstruction and leakage of your roof.